What makes you afraid? Not like jump-scares in movies or the rush of a roller-coaster, but what are your legitimate fears that qualify as phobias? Spiders? Clowns? Blood? Flying? Researchers at The University of Texas at Austin are experimenting with exposure therapy in virtual reality to help people manage their fears. For some phobias, like arachnophobia, the fear of spiders, this seems like a perfect fit. If you are certain that you are safely in a spider-free laboratory wearing a VR headset, and you see a giant spider crawling across your field of vision, the fear may be more manageable than being asked to put your hand into a populated spider tank. After the experimental therapy, participants were asked to take the spider tank challenge. Subjects who were not shown VR spiders were less enthusiastic about keeping their hands in the tank. This is not definitive proof, but it is a promising start. High-end VR equipment and homemade rigs are in the budget for many gamers and hackers, and our archives are an indication of how much the cutting-edge crowd loves immersive VR. We have been hacking 360 recording for nearly a decade, long before 360 cameras took their niche in the consumer market. Maybe when this concept is proven out a bit more, implementations will start appearing in our tip lines with hackers who helped their friends get over their fears. TensorFlow is a popular machine learning package, that among other things, is particularly adept at image recognition. If you want to use a webcam to monitor cats on your lawn or alert you to visitors, TensorFlow can help you achieve this with a bunch of pre-baked libraries. [Eric] took a different tack with PrintRite – using TensorFlow to monitor his 3D printer and warn him of prints gone bad – or worse. The project relies on training TensorFlow to recognize images of 3D prints gone bad. If layers are separated, or the nozzle is covered in melted goo, it’s probably a good idea to stop the print. Worst case, your printer could begin smoking or catch fire – in that case, [Eric] has the system configured to shut the printer off using a TP-Link Wi-Fi enabled power socket. Currently, the project exists as a plugin for OctoPrint and relies on two Raspberry Pis – a Zero to handle the camera, and a 3B+to handle OctoPrint and the TensorFlow software. It’s in an early stage of development and is likely not quite ready to replace human supervision. Still, this is a project that holds a lot of promise, and we’re eager to see further development in this area. There’s a lot of development happening to improve the reliability of 3D printers – we’ve even seen a trick device for resuming failed prints. In this week’s edition of, ‘why you should care that Behringer is cloning a bunch of vintage synths’, I present to you this amazing monstrosity. Yes, it’s a vertical video of a synthesizer without any sound. Never change, Reddit. A bit of explanation: this is four Behringer Model Ds (effectively clones of the Moog Minimoog, the Behringer version is called the ‘Boog’) stacked in a wooden case. They are connected to a MIDI keyboard ‘with Arduinos’ that split up the notes to each individual Boog. This is going to sound amazing and it’s one gigantic wall of twelve oscillators and it only cost $800 this is nuts. Tuesday is Fastnacht day. Fill your face with fried dough. The biggest news this week is the release of a ‘folding’ phone. This phone is expensive at about $3000 list, but keep in mind this is a flagship phone, one that defines fashion, and an obvious feature that will eventually be adopted by lower-cost models. Who knows what they’ll think of next. It’s a new Project Binky! This time, we’re looking at cutting holes in the oil sump, patching those holes, cutting more holes in an oil sump, patching those holes, wiring up a dashcam, and putting in what is probably the third or fourth radiator so far. Here’s a Kickstarter for new Nixie tubes. It’s a ZIN18, which I guess means an IN18, a tube with a 40mm tall set of numbers. This is the king of Nixie clocks, and one tube will run you about $100. Nah, you can also get new Nixies here. The Sipeed K210 is a RISC-V chip with built-in neural networks. Why should you care? Because it’s RISC-V. It’s also pretty fast, reportedly 5 times as fast as the ESP32. This is a 3D rendering test of the K210, with all the relevant code on the Github. I’m not sure if everyone is aware of this, but here’s the best way to desolder through-hole parts. Heat the solder joint up and whack it against a table. It never fails. Hitting things is the best way to make them do what you want. It is getting so easy to order a finished printed circuit board that it is tough to justify building your own. But sometimes you really need a board right now. Or maybe you need a lot of fast iterations so you can’t wait for the postal service. [Thomas Sanladerer] shows how he makes PCBs with a CNC machine and has a lot of good advice in the video below. He starts with Eagle, although, you could use any creation package. He shows what parameters he changes to make sure the traces don’t get eaten away and how to do the CAM job to get the files required to make the boards. If you don’t use Eagle, you’ll need to infer how to do similar changes and get the same kind of output. We’ve only heard a few people pronounce Gerber (as in Gerber file) with a soft G sound, but we still knew what he meant. We have the same problem with GIF files. However, once you have Gebers, you can join the video’s workflow about 5 minutes in. At that point, he uses FlatCAM to convert the Gerbers to a single G-code file that integrates the paths and drill files. There were a few tricks he used to make sure all the tracks are picked up. Other tricks include leveling a spoil board by just milling it down and mounting different size bits. He also has ideas on aligning the Z axis. China, we’re told, can make anything. If you need some PCBs in a few weeks, there are a few factories in China that will do it. If you need a nuclear reactor, yep, there’s probably a factory in China that’ll do it because nuclear reactors are listed as one of the items facing new tariffs when imported into the United States. No, I am not kidding. What about LCDs? What about old-school character LCDs? Is it possible to find a factory in China that will make you the LCD you want? That’s what [Robert Baruch] will find out, because he’s repairing an old computer with new parts. The object of this repair and restomod is a TRS-80 Pocket Computer (PC-1), otherwise known as the Sharp PC-1211. It looks like a calculator, but no, it’s a legitimate computer you can program in BASIC. [Robert] bought this computer for a bit more than $5 on eBay ‘for repair’, which means the zinc-air battery was dead, and unfortunately, the LCD was shot. The LCD technically works, but it just doesn’t look good. Sometime in the last thirty years, moisture got in between the layers of glass, polarizing film, and liquid crystal. This is not unique to [Robert]’s unit — a lot of these PC-1s have the same problem, many of these broken seals rendering the computers themselves useless. This is an ancient computer, and replacements for this LCD are impossible to find, but because the Sharp PC-1211 is well documented, it is possible to find the datasheet for the original display. With that, it’s just a question of finding an LCD manufacturer that will do it. So far, the costs look good — $800 USD ($300 for tooling and 10 samples, $500 for another 200 LCDs) is what it’ll take to get a few units. [Robert] already has a few people interested in repairing their own Pocket Computers. You can follow the eevblog thread here, or check out the video below. In the world of ham radio, a “Fox Hunt” is a game where participants are tasked with finding a hidden transmitter through direction finding. Naturally, the game is more challenging when you’re on the hunt for something small and obscure, so the ideal candidate is a small automated beacon that can be tucked away someplace inconspicuous. Of course, cheap is also preferable so you don’t go broke trying to put a game together. 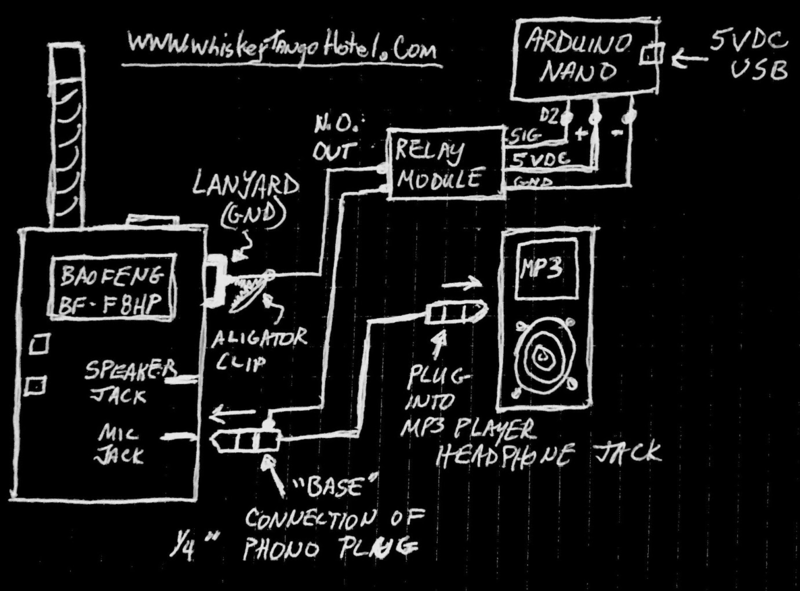 As you might expect, there’s no shortage of kits and turn-key transmitters that you can buy, but [WhiskeyTangoHotel] wanted to come up with something that could be put together cheaply and easily from hardware the average ham or hacker might already have laying around. The end result is a very capable “fox” that can be built in just a few minutes at a surprisingly low cost. He cautions that you’ll need a ham license to legally use this gadget, but we imagine most people familiar with this particular pastime will already have the necessary credentials. The heart of this build is one of the fairly capable, but perhaps more importantly, incredibly cheap Baofeng handheld radios. These little gadgets are likely familiar to the average Hackaday reader, as we discussed their dubious legal status not so long ago. At the moment they are still readily available though, so if you need a second (or third…), you might want to pull the trigger sooner rather than later.